What's Next? Sixth Season Of 'Veep' Probes Post-Presidential Life Julia Louis-Dreyfus says growing up in Washington, D.C., and later living in Los Angeles helped her prepare for her role in the HBO comedy. "You're selling a brand of yourself," she says. Julia Louis-Dreyfus has won the "Outstanding Lead Actress In A Comedy Series" Emmy five times for her portrayal of Selina Meyer in HBO's Veep. Louis-Dreyfus also did plenty of research for the show, now in its sixth season. She talked with lobbyists, senators and even former vice presidents. "I really tried to ask questions that would get at: What is the human experience of this position?" she says. "Nothing about policy or anything like that, but just about: What it's like day to day? ... It was also interesting to watch them not answer or read between the lines." After a couple of seasons as the vice president, Selina Meyer actually does become president briefly, but doesn't get re-elected in a runoff election. In this new season she and her posse of staffers and former staffers are struggling to figure out what to do next. 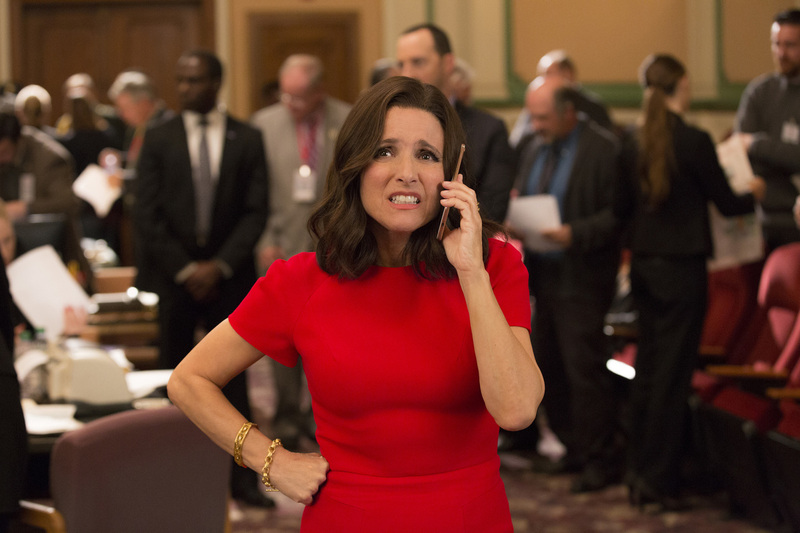 There have been no shortage of comparisons of the character to Hillary Clinton, but Louis-Dreyfus says the show was written before the 2016 election. "There is post-presidential life, you don't just fall from the face of the Earth." Louis-Dreyfus says. "Selina Mayer is very, very ambitious and she has a huge chip on her shoulder, so there's a lot of mileage there." On the show we have never identified party — we have just reaped so much benefit from that. Because everybody is invited ... both sides of the aisle think we are making fun of the other party. ... They identify with it which is super fun. I love that. We all sort of wince. Very often there are lines that a multitude of characters might say that are so foul and nasty and mean-spirited that we all sort of die a little bit. ... But you need to know that the group itself of actors and writers are incredibly kind and nice. They are the absolute opposite of the characters that they play. We do have a chemistry, we're very good friends and we rehearse a lot. ... It's all of those things. ... Tony Hale is notorious for breaking in a scene and so that's often why we also have to rehearse a lot is for him to sort of get that out of his system. I think she's very vulnerable. She's incredibly brittle and just covers it up like crazy. ... It's like a toothpaste tube and you put holes in it and then you squeeze ... and toothpaste goes out in lots of different directions and you didn't expect it. I feel like that's what she's like with her emotional life. Radio producer Anjuli Sastry, radio editor Mallory Yu and web producer Beth Novey contributed to this story.